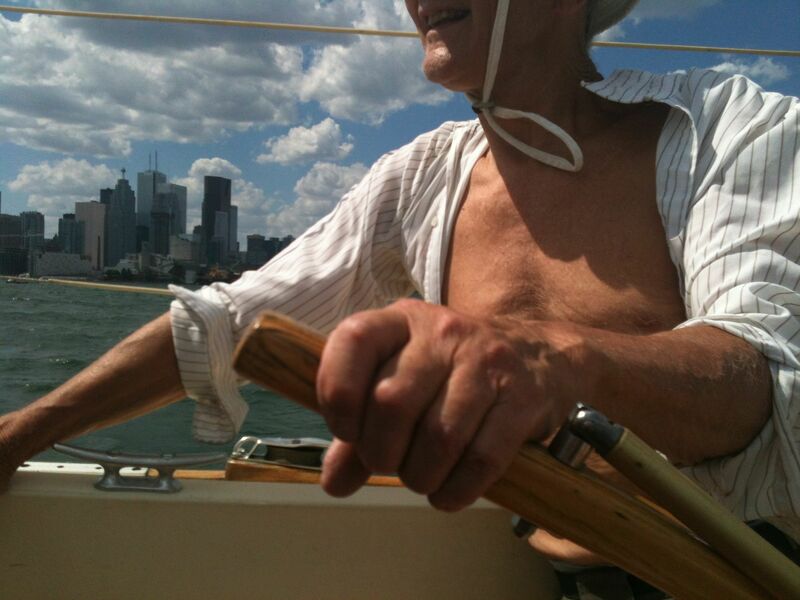 So I set off late to meet Blake and go sailing, but since Blake is unlikely to care about punctuality, I’m not worried. What I am apparently is absentminded. I sit at the “punishment” light at the bottom of my street, daydreaming. Four minutes later I wheel left and then right up the ramp to the Gardiner Expressway. No traffic. Great! Soon I am flying by the last exit to the Lakeshore which runs parallel and, oddly enough, along the lake shore. The Gardiner is about to achieve elevation. I realize I should have taken that exit. That last exit! I realize I should, in fact, have turned right at the punishment light and taken Lakeshore Blvd. I am on the wrong road altogether! Okay, now I’m worried. Surely if I take the Spadina exit, I can turn right, go south and double back on the Lakeshore. I sail down the exit. Absolutely no right turn. Because the Lakeshore eastbound lanes are where the turn should be.The westbound lanes are no where to be seen. Darn. I turn left, avoid the first left turn as unpromising, carry on up over the railway tracks and slide into the left turn lane for Front St. Oh good, we have an advanced green. Not so good, we have a driver who is waiting for something better. That’s what my horn is for, tinny though it is. At Bathurst, I catch another punishment light. An orange and green taxi and my red Yaris, wait and wait and wait. Then we are released to turn left and re-cross the railway tracks. Left or right? Left or right, Joyce? Make up your mind. Okay I pick right. Alas. While it is the right direction- I can see the Tip Top Tailor sign on the top of a building, I can’t get there- I am on Fleet St, which parallels Lakeshore W, but never the twain shall meet. I have to keep driving west, on the other side of the dedicated streetcar line, well-protected by concrete barriers. I steam on in the direction of the Exhibition, our seasonal adventure in frivolity. Okay finally, an available left hand turn onto Strachan. With an advanced green and a mere 7 cars waiting. The light changes. We’ve got it. Guys! Guys! I am 7 cars back but the only one willing to tell those stupid tourists at the front how to turn on an advanced green. Since there is a T intersection at the Lakeshore, I make the left turn easily for once. And at last I am back where I should have been 20 minutes ago. Blake is sitting in the club dining room, over the remains of his late (very late) breakfast, unperturbed, and he orders me a glass of pinot noir to calm me down. By the time we collect his little dog and take the water taxi out to where Sirroco is moored it is mid-afternoon. Not that it matters. Sailing proceeds on slow time. The bugs have to be swept up. Well, some of them, anyway. The mainsail cover has to be removed and shaken. We have to decide which genoa to use. The wind isn’t quite as gentle as Blake led me to believe, so I vote for the #2. Astonishingly, he agrees. As usual, the main gets caught as he pulls it up. He starts the motor and hands me the tiller. 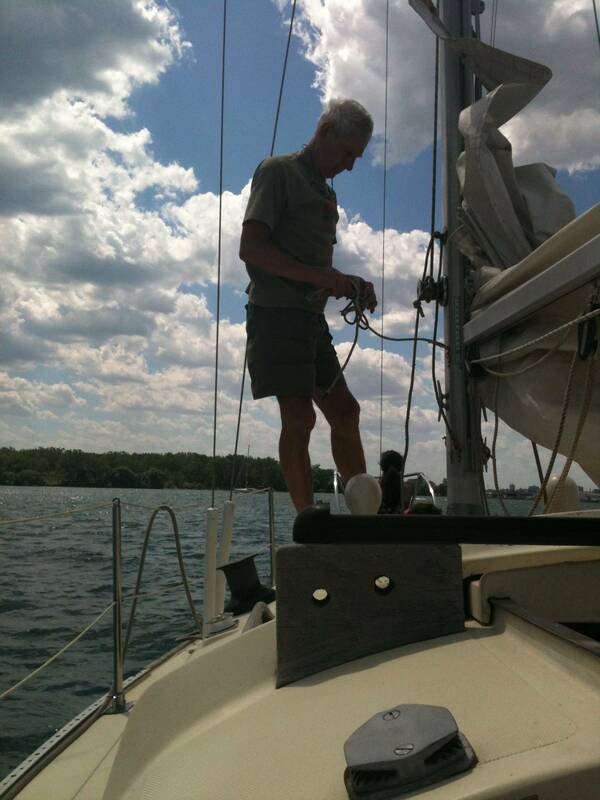 There are two things about steering a sailboat with a tiller. It’s like driving from the back seat of a car and once the sails are up, visibility gets worse. Then there is the fact that if you want to go starboard (right to you landlubbers) you push the tiller left and vice versa. Oh my goodness! There is a motor launch bearing down on us portside and downwind a smaller sailboat. The southwest wind has freshened and there is a nasty little chop. Panic! Panic! Then suddenly, my almost 40 year-old body-memory takes over and I discover, not only that I can steer, but I know who to avoid and who has to avoid us. Once the sails are up, I find it easy to keep them full by nudging the tiller gently. It’s like playing a huge kite high in the air. I am part of the boat. 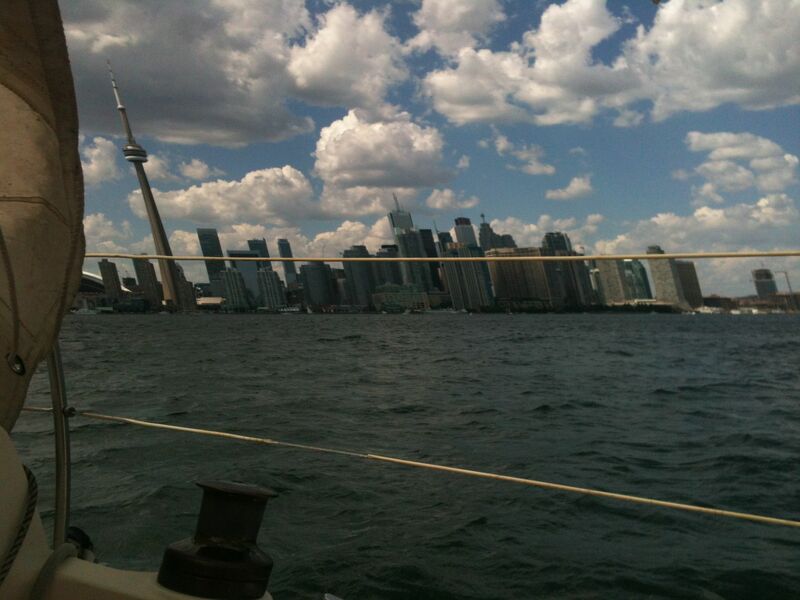 We sail west to Humber Bay and come about. By now the dog has given up her post as a living figurehead jutting out from the prow and has come back to the cockpit. She is wearing a dog life jacket with a convenient carrying handle on her back. A long line is attached to it. She has on occasion fallen or jumped in, swum about and been pulled back aboard. Never at speed. 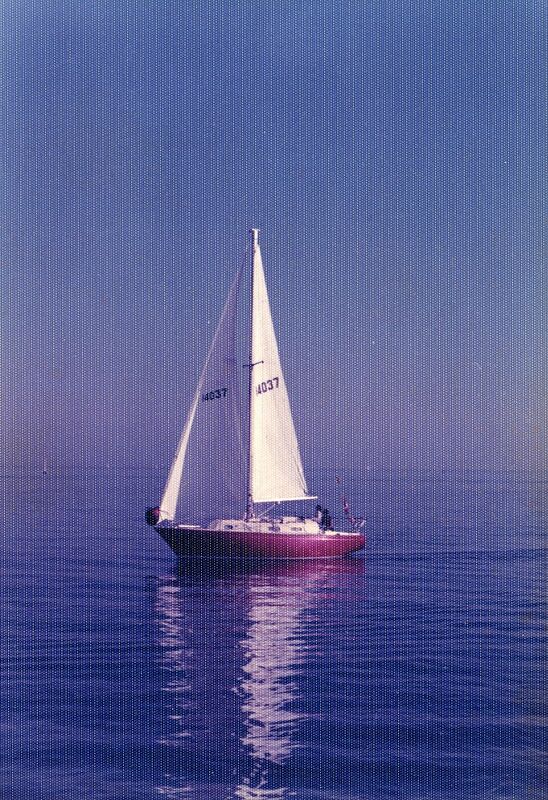 I once learned a physics lesson while trying to fill a pail with water at 6 knots. I bore the stigmata on my palms for some time. “Do you want to sail around the island?” Blake asks. ‘Twas ever thus. It sounds like such a good idea. “Will you get too tired?” he asks. “I don’t know,” I reply. I seem to have spent my life agreeing to such good ideas. And living to see it was not wise. I imagine that I will be very very tired if we sail around the island, but it is such a good idea. So we do. In my defense, I can only say that we skip jumping off for a swim. Now that we are going downwind, we seem to be standing still. Only the trees move in relation to the CN Tower. Perspective seems distorted. The people walking on the island seem like ants, but I know we are not that far away. Kayakers and paddlers on boards, miniscule. The freighter at the wharf, not so much. Like Alice in Wonderland, I resort to nibbling – on a cheese tray and handing large chunks to skipper Blake on the knife blade. We forgot the crackers. The dog has been sitting on me so long that both of us need to stretch. A good time to come about again. But the southwest wind isn’t as strong as it was. Perhaps it is evening coming on or the city moderating its influence. Blake decides to put the motor on and take down the sails, handing me the tiller just as we are about to pass in front of the ferry dock. Which is fully loaded, two car ferries straining at the bit. While it is true that we have the right of way over large motorized vessels, it is not a point I want to press. But, hey, I take my ease. I make my own decisions and they turn out to be the right ones. I do draw the line at getting the boat through the gap and hooking the mooring line up over the cleat. It has been only 5 hours, but 5 hours of the most beautiful water and sky. Five hours of peace that passes understanding. It feels as if I have had a week’s holiday. And it will only be 2 days before this septuagenarian body gets rested.